For anyone attending the annual South By Southwest Festival (SXSW) in Austin, Texas, the week of March 12, the decisions are painstaking. Who do you miss, so you can see someone else? A Green Day fan who also loves the Flaming Lips and Depeche Mode will know this catch-22 all too well come Friday night. ut before then, for your convenience, here are the big names kicking off the Music portion of the festival on Tuesday, all of which you likely won't want to miss. 1) Butch Hancock and Rory Hancock, 8pm, Saxon Pub - Any trip to Texas should include a moment with a member of the Flatlanders. Some years it's Joe Ely, others it's Jimmie Dale Gilmore. This year it's Butch Hancock, whose peerless songwriting reminds us of why you don't mess with Texas. 2) People Of Letters featuring Amanda Palmer, John Sayles, Jenny Owen Youngs, Neil Gaiman, Emma Swift & Buck 65, 9pm, 18th Floor at Hilton Garden Inn - This is listed as "Avant-Garde," so who knows what will transpire on the 18th floor of the Hilton Garden Inn, but the chance to see film director John Sayles, the Dresden Dolls' Amanda Palmer, author Neil Gaiman, and Canadian hip-hop artist Buck 65 all in one spot doing something inexplicable is a chance worth taking. 3) Ra Ra Riot, 12am, Hype Hotel - Their new album Beta Love shows them getting slicker with each release. The indie roots are sprouting into a confident synthpop band. Come see the maturity. 4) Ryan Bingham, 1am, Central Presbyterian Church - Even if you only saw Mr. Bingham in the Jeff Bridges film Crazy Heart singing his Oscar-winning tune "The Weary Kind," you know this is a man who can hold a room. Now see what he can do in a church. 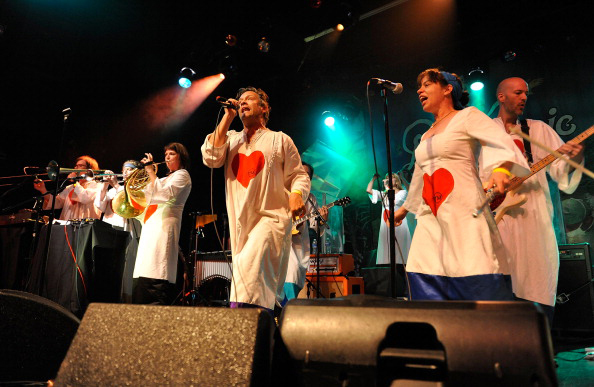 5) The Polyphonic Spree, 1am, Red 7 Patio - Their new album (their first in six years), Yes, It's True, awaits its release in May. To get a peak--and to see how many members they currently have--spend the early morning hours counting at Red 7 Patio with the Spree.